I would never take time off of work so that I could spend the night with a girlfriend and not my husband! I would never do that. I would not spend that time gleefully shopping and going to dinner and a movie while my husband stayed home with the kids. Nope, not me. I certainly did not burn the banana bread because I was distracted by Oprah. I would never be that careless with my time. 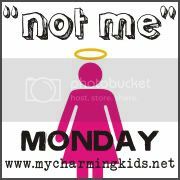 Nope, not me! I am never late returning library books. I've never had to pay more money than I would care to mention in library fines. Nope, not me. I certainly would not be grumpy with the librarian who lectured me on returning books on time. She should be thanking me for being late and keeping the library funded! I mean, if I were late. I would never wear my jeans with a hole in the crotch because they are my favorite pair. I just wear them with a long shirt. I mean, if I would do such a thing! I would totally never have seventeen different colors of toenail polish on, each progressively darker, so you cannot see the previous color, because I am too lazy to clean it off and start over again. Not ever.